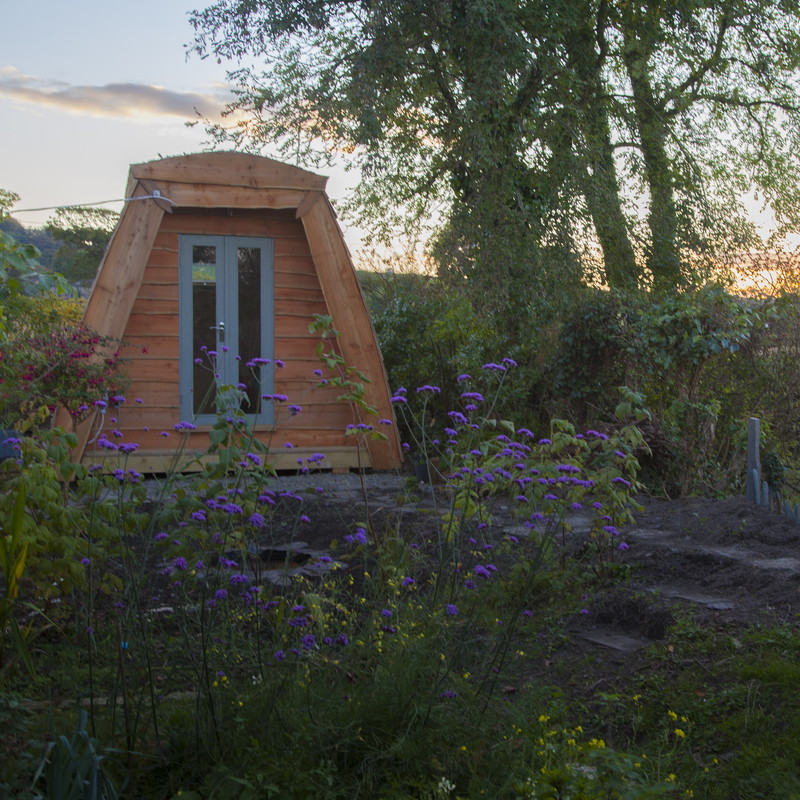 Webuilds bothies are beautiful, bespoke and ecological alternative living spaces. They are built from sustainably-sourced local materials and hand-crafted to exacting standards and can be used as art studios, home offices, guest rooms and even teenage boltholes! Sometimes referred to as pods, they look equally at home in private gardens, commercial spaces or on campsites. How big are Webuilds bothies? Our standard bothies measures 3.6m x 3m (exterior). Smaller sizes for children are available though so please give us a ring if you’d like to find out more. A larch frame and cedar shingles, all cut from managed forests within 50 miles of our site. These carefully selected woods are then seasoned for 2 years before being used, to ensure that once constructed, the timber is unlikely to move or crack. We choose larch for its fast-growing character, as well as its resilience to rot. (It is often favoured in boat construction for this very reason.) The cedar shingles produce their own oil which gives them an untreated life expectancy of 30 to 50 years. This beautiful timber weathers over time to an aesthetic silver texture, with higher insulation values than any other soft wood available. It is also so weather proof that it doesn’t technically require a waterproof membrane but we construct our bothies with a breathable membrane to ensure a comfortable climate control inside. How do you insulate the bothies? We use a combination of Warmcel™ fibre, Thermafleece™ Superquilt wool and hemp matting to guarantee optimal insulation throughout our bothies. We use Warmcel™ in the curved roof and floor. Made from 100% recycled newspaper, Warmcel ™ has a high compressive strength, is light weight and has high insulating properties. Thermafleece™ is used to form an inner ‘skin’ on the bothy, before being clad with our beautiful tongue and groove. This is a highly breathable, natural product produced exclusively in the UK. The hemp matting used in the vertical surfaces of the face and rear elevations works in tandem with the other products to optimise both thermal and acoustic barriers. Hemp fibres lock in 2 tonnes of CO2 for every tonne of hemp during growth, which remains in the material throughout its life. Hemp insulation also absorbs 20% of its weight in moisture without affecting its thermal performance. We carefully selected hemp, not only for its low eco impact in production and processing, but also because it out-performs other fibre-based products for its thermal conductivity and naturally fire-resistant qualities. It’s also a durable cellulose material that does not attract rodents or provide a food source for moths and insects. This beautiful and sustainable roofing system utilises grass and local vegetation to create a thermal mass that both keeps you warm and provides a system to support a wide range of plants, birds, insects and bees. By researching the local plant species in your area, we can tailor the roof of your eco pod to provide an environment that encourages local wildlife to thrive. In urban areas, this green thermal mass can also help combat the heat island effect caused by high concentrations of concrete. By using a quality EPDM (ethylene propylene diene monomer), this roofing system has a long-life span which is maintenance free. We use argon-filled plantitherm glass panes to ensure a constant temperature control within the bothies. Yes. We use OS oil. This is a natural, oil-based micro-porous coating that allows the wood to breathe, whilst bringing out its natural colour and grain. Selected for minimal maintenance, this long-life coating is water and dirt repellent and will not crack, flake, peel or blister. Do Webuilds bothies come with fitted electrics? Yes. We use internal and external lighting spurs and supply two twin sockets as standard. Webuilds bothies require no foundations or ground works. However, their longevity means that they are considered permanent structures so planning permission may still be required. As such, we recommend contacting your local planning authority. Most will be happy to provide informal advice by email or telephone. How much do Webuilds bothies cost? Do you install the bothies on site or will I need to arrange for separate installation? Every situation is unique and we will advise accordingly. We can deliver our Webuilds bothies to anywhere within the UK and Ireland.